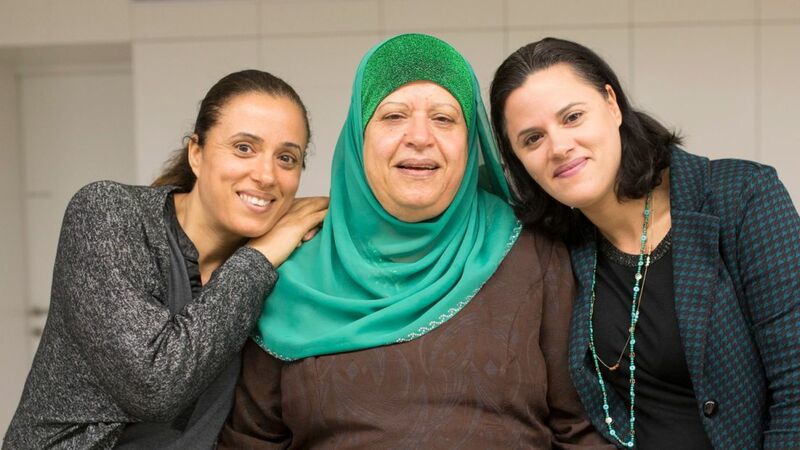 The newly independent all-female Rana Choir of Jaffa, a rare example of a successful coexistence project, sings in Arabic and Hebrew, as well as in Ladino and Yiddish. As news broke last month of a stabbing rampage in Jaffa, members of Israel’s only Jewish-Arab women’s choir had to make a quick decision: cancel practice that evening or hold it as usual? The terror attack near the beach, in which an American graduate student was killed and 10 people were wounded, was close to their rehearsal space. After a frenzied round of phone calls, it was decided to go ahead with the weekly rehearsal, even though no one was quite in the mood to sing. 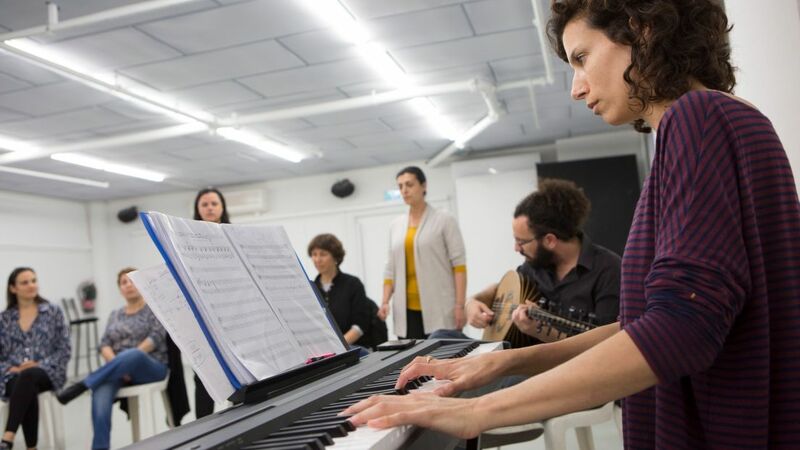 On April 11, the group will give its first performance as an independent choir, after eight years under the auspices of a Jaffa community center. There, it was called Shirana (a fusion of the Hebrew and Arabic words for song, shir and rana, respectively). The move is a risky one: The singers are trading guaranteed public funding for a shot at greater artistic freedom. As part of the rebranding, the choir’s name has been changed to simply Rana. Among the choir members, who range in age from mid-30s to mid-60s, are Christians and Muslims, as well as both religiously observant and nonobservant Jews. One woman enters the rehearsal studio wearing a cross around her neck, another a Star of David. The oldest member of the group has a hijab wrapped around her head. Most, however, avoid any signs of their religious affiliation. In addition to the clinical psychologist, there is a graphic artist, a hairdresser, a social worker, an office administrator and a bunch of teachers. Not one is a professional musician. Dany first conceived the idea of the choir when she moved from Tel Aviv to Jaffa. “I felt that I suddenly had an opportunity to do something more meaningful than going to peace demonstrations and whining all the time,” she says. The choir’s repertoire consists of old songs in Arabic, Hebrew, Ladino, Yemenite, Persian, Greek; the latest addition is a popular Yiddish tune. But by far, their biggest hit is their unique rendition of “Had Gadya,” the classic Passover song that concludes the seder. Inspired by the modern version written and recorded by Israeli songwriter Chava Alberstein, Dany has added her own twist — an Arabic translation of several verses. Why are you singing this traditional song? It’s not yet spring and Passover’s not here. And what has changed for you? What has changed? I have changed this year. How long will the cycle last? How long will the cycle of violence last? In the rendition performed by the Rana Choir, it is Sihrab Abu-Lassan, an Arab woman, who sings this part solo in Hebrew, in yet another twist on a twist. In recent years, the choir has been performing this version of “Had Gadya” — “our anthem,” Dany calls it — at the conclusion of the alternative joint Jewish-Arab Memorial Day service that has become an annual event. Abu-Lassan is one of the original members of the choir, as are her sister Badria Bouchari and her mother Alia Hatab, the woman in the hijab. “We don’t get a lot of support from the Arab community,” laments Abu-Lassan, a graphic artist now studying animation in the hope of making a career change. 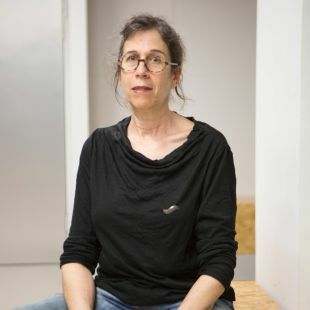 This lack of enthusiasm, explains her mother, is not only because many Arabs object to normalizing relations with the Jews as long as the occupation exists, and therefore, reject all coexistence initiatives out of hand. “Many Muslims also believe it is sacrilegious for women to sing publicly,” she says. But Hatab and her daughters aren’t swayed. “As soon as I heard at the local community center that there were plans to set up a choir, I knew I wanted to join,” says the 66-year-old mother of five, a retired educational counselor who holds a master’s degree in educational psychology and has long been admired by family and friends for her voice. Aharoni, the psychologist, was singing in a different choir when the Jewish-Arab singing group was established. “It was a tough choice, but I moved to the new choir because its message was so important to me,” she says. When she was 11, Aharoni’s father was killed in the Yom Kippur War. The trauma she suffered, she says, prompted her to later become an anti-war activist. In addition to membership in the Rana Choir, Aharoni is active in the Parents Circle Families Forum, an organization of Jewish and Arab families that have lost loved ones in the conflict and that supports peace. “I wouldn’t dream of scheduling anything else for Tuesday evenings,” she adds. 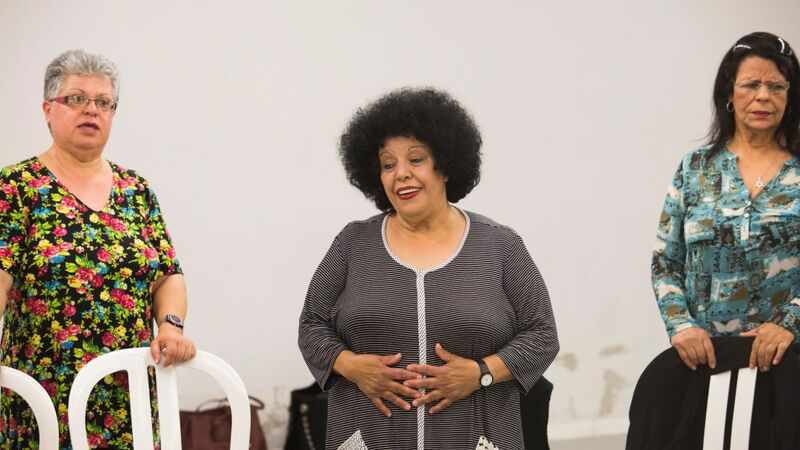 On this particular week, their last rehearsal before the kick-off performance, Hatab has prepared a special vegetable pie, which she slices up and passes around before the women make their way to the studio. Their coexistence effort has already survived two wars between Israel and Hamas in the Gaza Strip — but not without some strange moments, as Dany recalls. 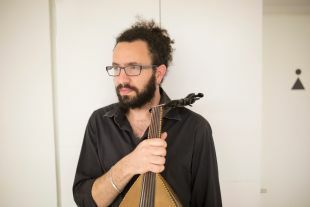 Artistic director and accompanist Idan Toledano is the only man in the group. “There’s lot of female energy around, and I do sometimes feel out of place,” he acknowledges. But his bigger concern these days is making sure the choir can stand on its own two feet. “This year, our first year as an independent act, will be our big test of survival,” he says. To guarantee that the show will go on, he says he is busy these days applying for grants and securing future engagements.